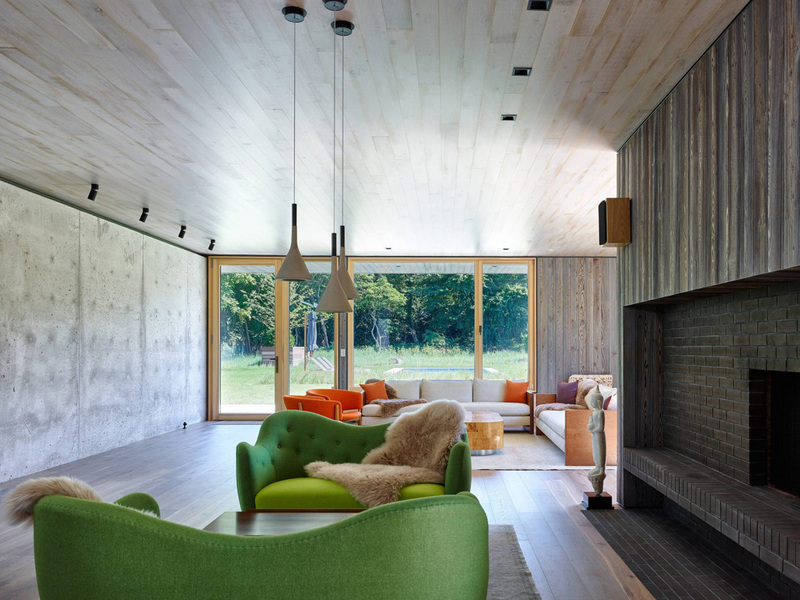 Maziar Behrooz Architecture has created a modern two-story house Amagansett, New York. 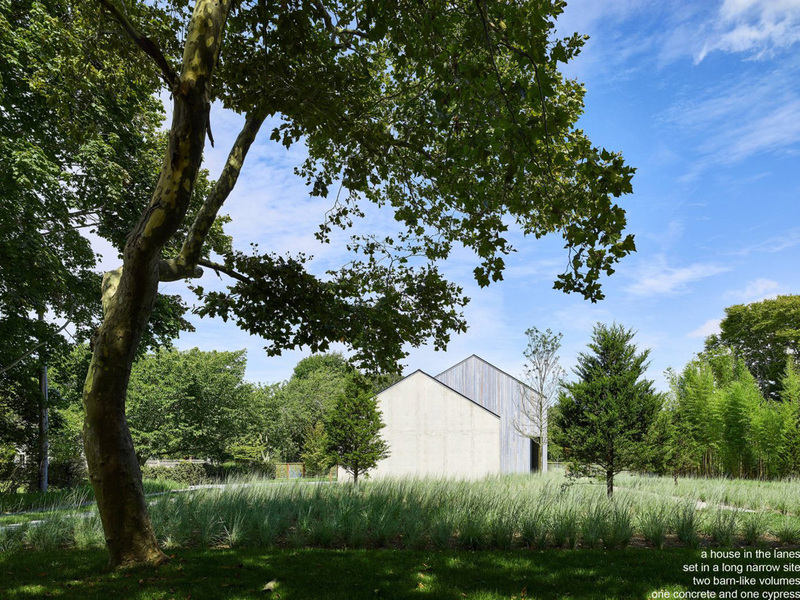 The “lanes” in Amagansett, New York, offer a nearly idyllic village life: adjacent to Main street, walking distance to ocean, but far enough to feel protected from it, walkable and dotted with a diverse range of houses and styles. Our challenge with this exceptionally long and narrow lot, with its long axis in east-west direction, was to create a home that would accommodate the owners wish for a maintenance-free structure, inside and outside, that would be a compelling fit in this historic neighborhood. Amagansett houses are congenial and often the facades that face the street are in dialogue with it. 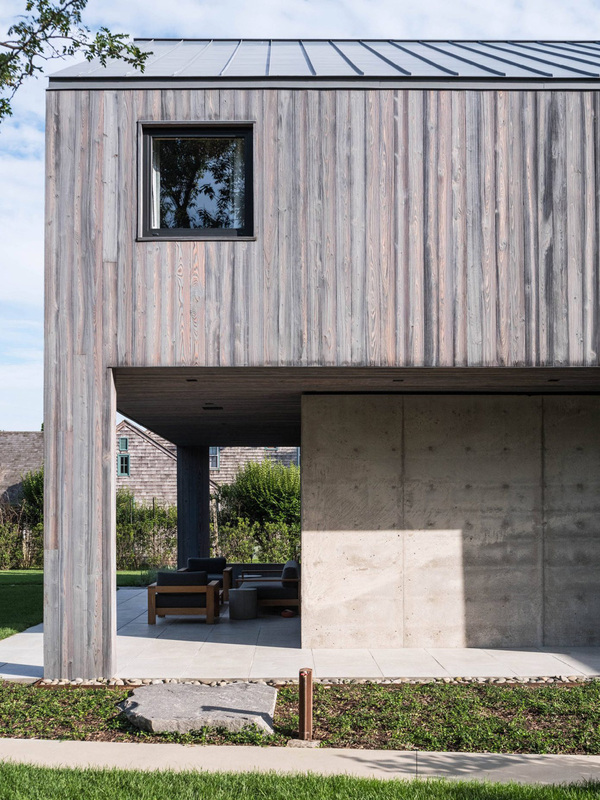 In this case, the conversation starts with a gable-end raw concrete wall; its profile echoing the familiar shape of a barn; it hides the garage which is entered from the north, and scales the front face of the house down to meet neighboring homes. The ground level of the house is dedicated to living spaces (living room, dining room, kitchen) and offers a bedroom for guests. In the living room, a raw steel box is inserted into the concrete wall providing an easily accessible area for our clients collection of rare and vintage vinyl records (which can be played on the turn-table in the adjacent vestibule). 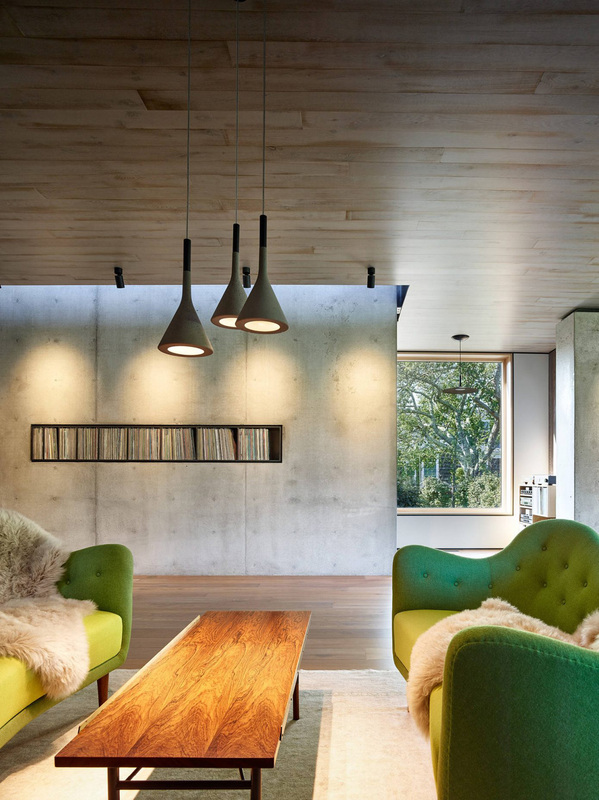 The connection with the outdoors, size of windows and overhangs, is carefully managed to both address the clients’ wish for a ‘womb-like’, cozy interior, as well as the filtering of natural light. The second floor holds the parents bedroom, at the far end, which is separated from the children’s bedrooms with a second floor porch and roof ‘cut-out’. 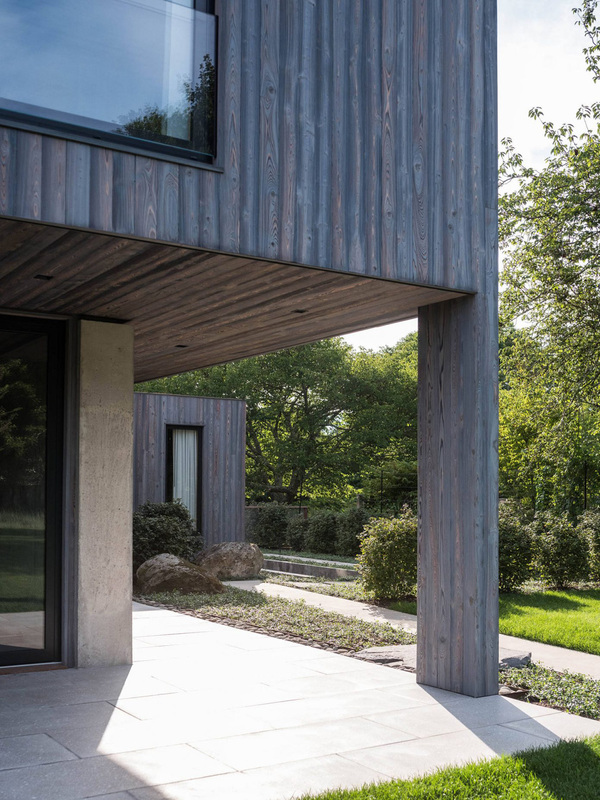 The porch is entered through a south-facing sliding glass door that, together with the north-facing ribbon window, allow natural light to penetrate the house from above and get reflected and drawn into the heart of the house via the concrete stair-wall. A sunken courtyard on the south side of the house and a generous light-well on the north, break the ‘even-ness’ of the horizontal site, and allow light to be filtered into the lower level, transforming a basement into a well-lit family room with a private outdoor space.